We meet some people who do a special kind of rescue work. 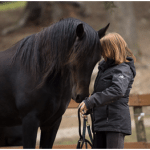 Serenity Equine Rescue’s Patricia Clark, speaks with KBCS’s Judy Lindsay about her experience saving animals from hoarders. ← Fair Trade Friday is Here!